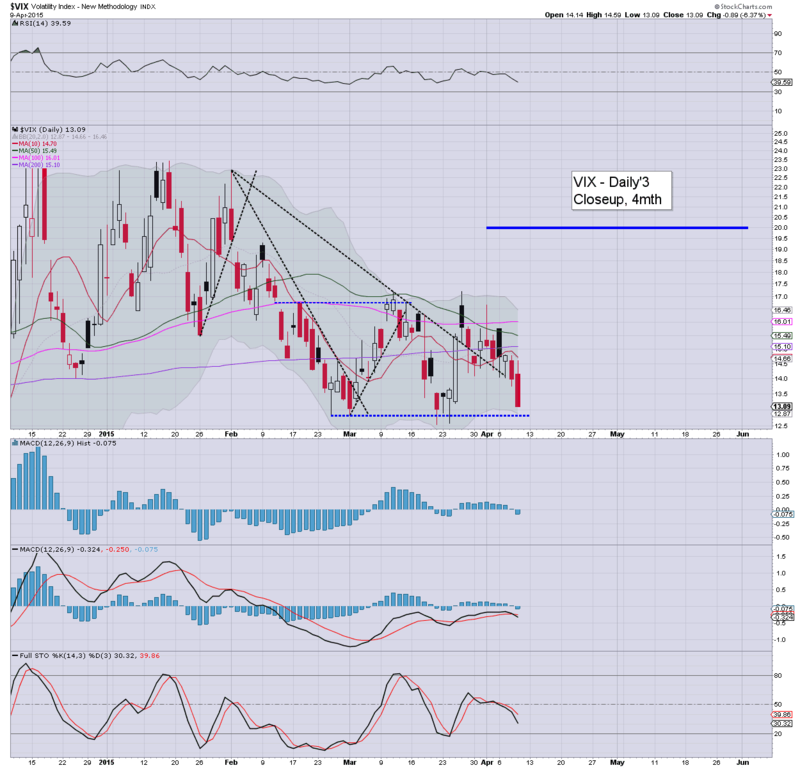 With equities breaking above key resistance in the closing hour, the VIX broke lower, settling -6.4% @ 13.09. With a daily close in the sp'2090s, any hope of VIX 20s is now off the menu... until at least mid May. 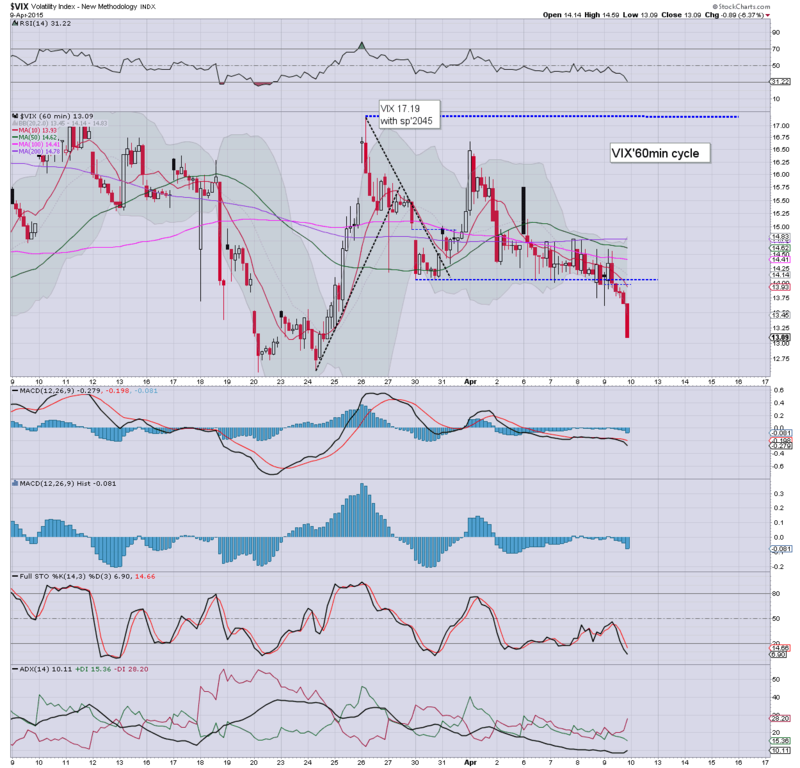 With US equities settling above key resistance of sp'2088/89, the VIX snapped lower into the close. Any near term hopes of VIX in the 20s are now gone.. and VIX will likely remain subdued for some weeks. Seasonally, equity bears have 'some hope' by mid May... but by then, the sp'500 could be in the 2150/75 zone, which is where the monthly upper bollinger is lurking. 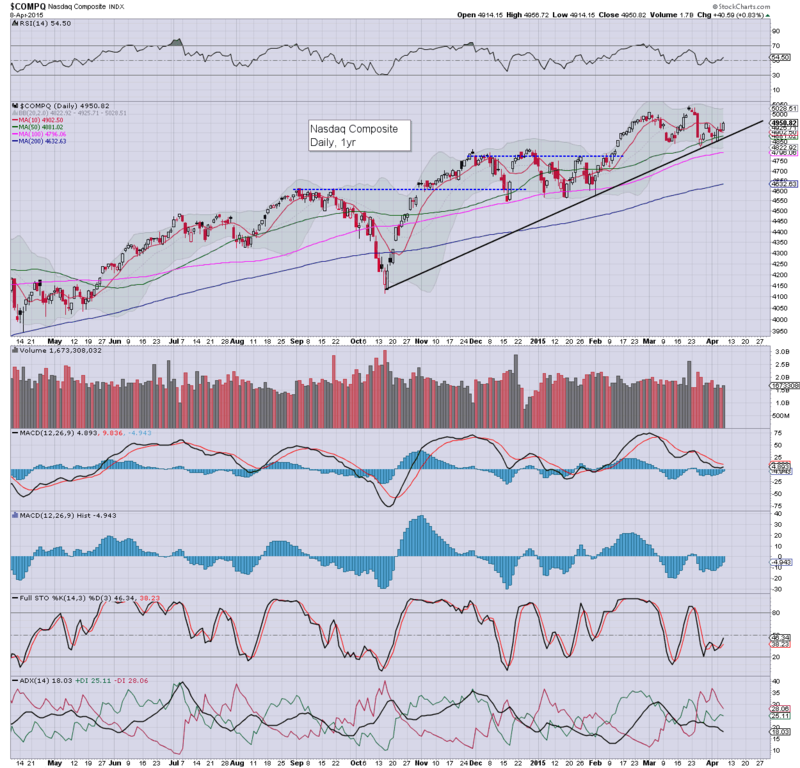 US equities closed moderately higher, sp +9pts @ 2091 (range 2074/93). The two leaders - Trans/R2K, settled +0.5% and -0.3% respectively. Near term outlook has turned bullish, with a decisive break above key resistance of 2088/89. The closing hour break higher into the sp'2090s is very significant, and arguably bodes well for the bulls for the rest of April... and into early May. US equities are seemingly content to see yet another hour of minor chop into the daily close. Metals are settling lower for the third consecutive day, Gold -$9. Oil vainly attempted a 2% rally... only to turn back negative... arguably already confirming the baby bear flag. Little to add... on what is merely another day of minor chop.. stuck in an increasingly tight range... 2086/74... a mere 0.6%. *Oil remains an alluring trade to consider. There is a particularly attractive price-gap zone, which looks set to be hit/filled tomorrow morning. If the mood takes me... I'll take that level.. and hold long across next week. notable weakness, AA -4.2%... but more on that one after the close. 3.06pm... another attempt to break resistance... sp'2088... but its difficult to see why we'd break higher today... overall price action remains very subdued. 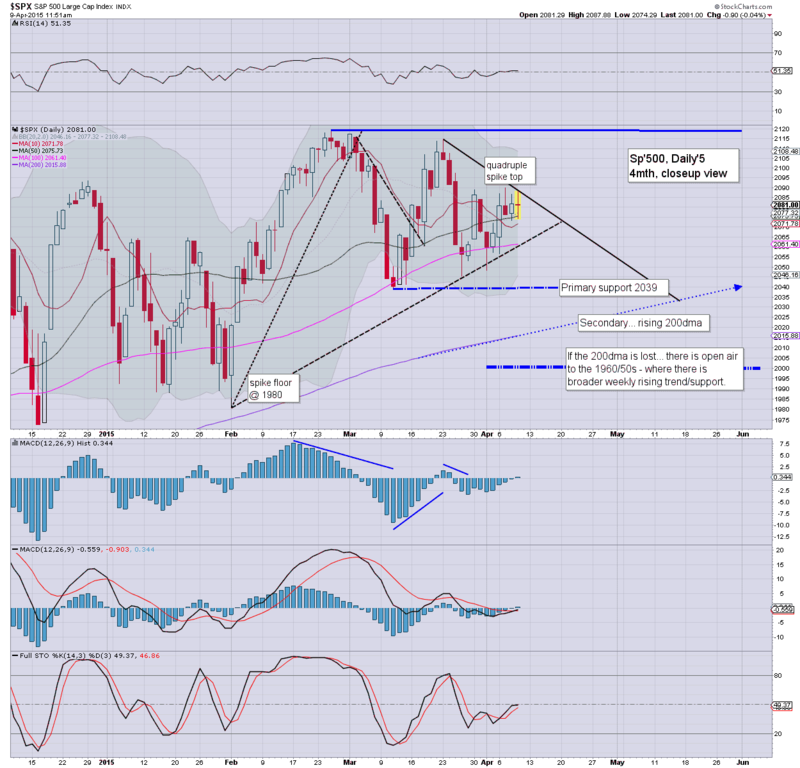 Clearly though.. a daily close in the 2090s would be VERY bullish for the weeks ahead.. if achieved. 3.23pm... sp'2090... well, its looking like bulls win another round.. as a truck load of short-stops are no doubt getting hit. VIX breaking lower, -4% in the 13.40s. Another minor up cycle... and again... stuck at sp'2086, with a VIX -1.4% in the 13.70s... indicative of a market that has effectively no worries about anything. Metals remain broadly weak, Gold -$8. Oil is holding sig' gains of 1.3%.. but price structure remains a bear flag for early Friday. Nothing has changed since the last hour. Oil has a notable bear flag... certainly, I'll be surprised if we don't see at least some weakness tomorrow morning. 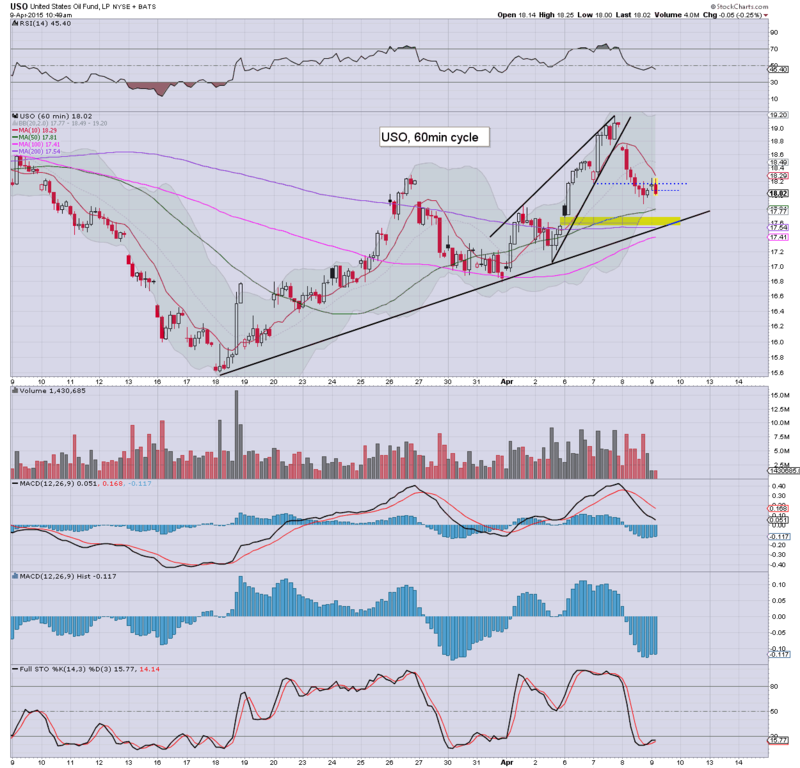 notable weakness: AA, -3.9%.. off the lows, but price structure remains extremely bearish into the summer. US equities remain in moderate chop mode... stuck under key resistance of sp'2088/89, but with the bears unable to hold under the 50dma (2075). Metals remain weak, Gold -$8. Oil is holding moderate gains, +0.8%, but price structure is a baby bear flag. *I remain content to watch Oil.. seeking a USO-long entry in the $17.70/50s... early tomorrow. 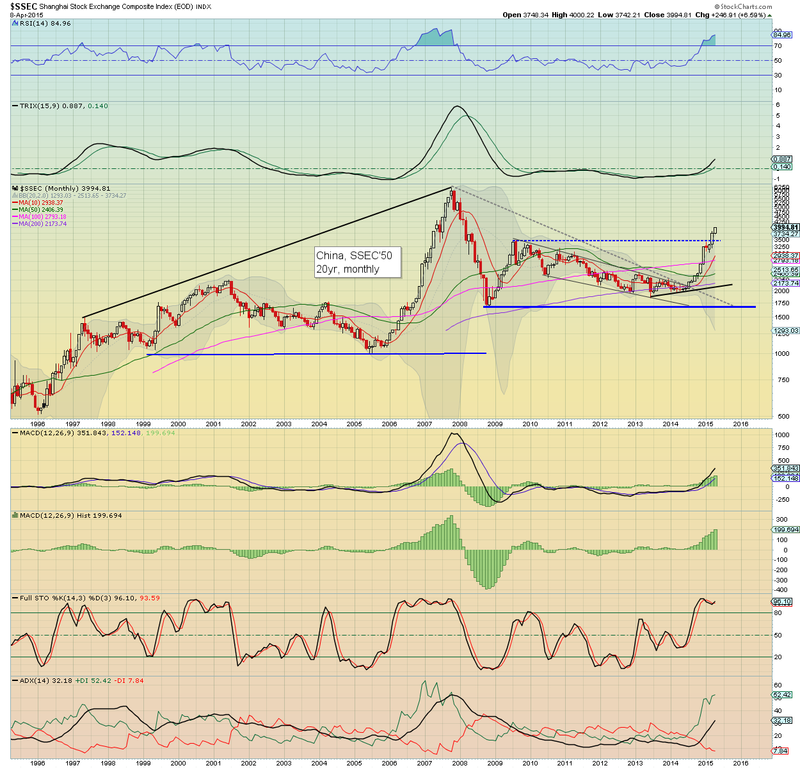 A move in WTIC Oil to at least $60 looks a given. Well, there really isn't anything to add. Market is clearly stuck... and will probably remain so into the weekend. To be clear.. any daily close >2088 would be very bullish, and open the door to new historic highs into early May. notable strength: BABA, +1.2%.. as the Asian markets continue to ramp. *A quadruple spike top on the daily chart.. its certainly bearish.. but any daily close >2088 would be VERY significant, and offer a straight run to new historic highs. So... it remains moderate chop... stuck under resistance.. but with the bears unable to sustain any downside move. There is little else to add. 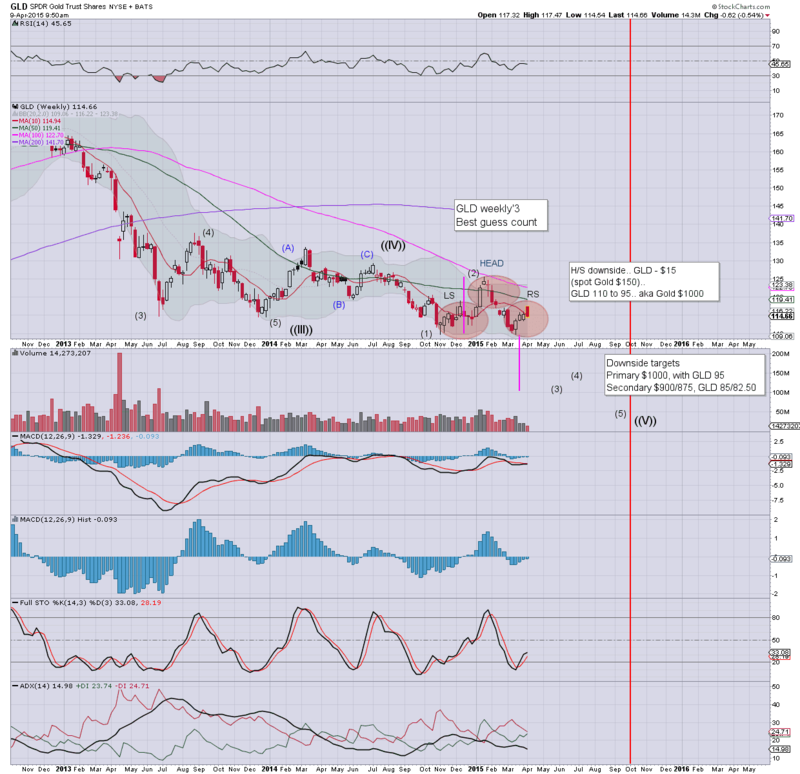 notable weakness: AA, -4.6%.. with a new multi-month low of $12.96. 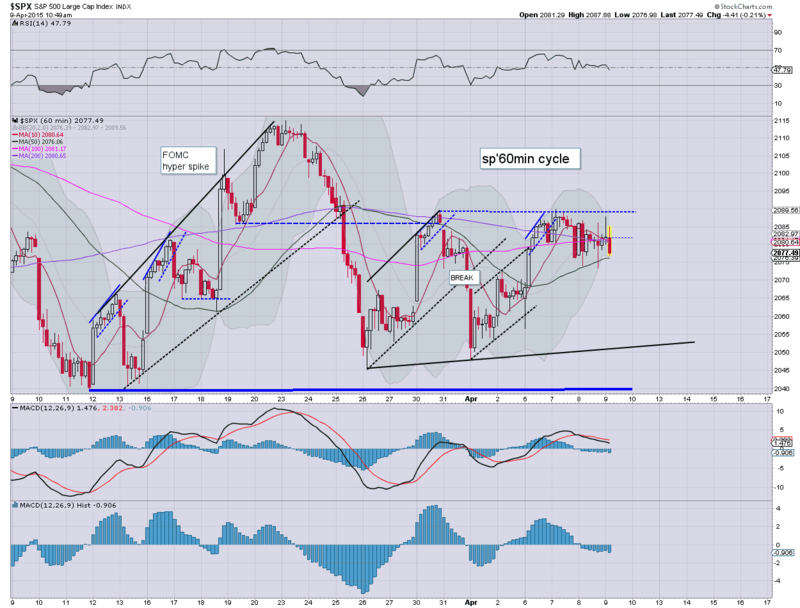 With no one willing to buy above sp'2088... the market has naturally rolled over again, into the sp'2070s. Metals remain weak, Gold -$8, with Silver -1.8%. Oil has turned negative, -0.2%.. the $50 threshold looks set to fail. *I continue to keep an eye on Oil... but am not particularly in the mood to get involved today. Will consider going long tomorrow. So... sp'2077... with VIX +3% in the 14.40s. A daily close <2070 with VIX 15s should be first objective for the bears. 11.35am.. Another fractional break of the 50dma (now 2075)... but bears just not showing any sustained downside power.... as reflected in a VIX that is barely positive. 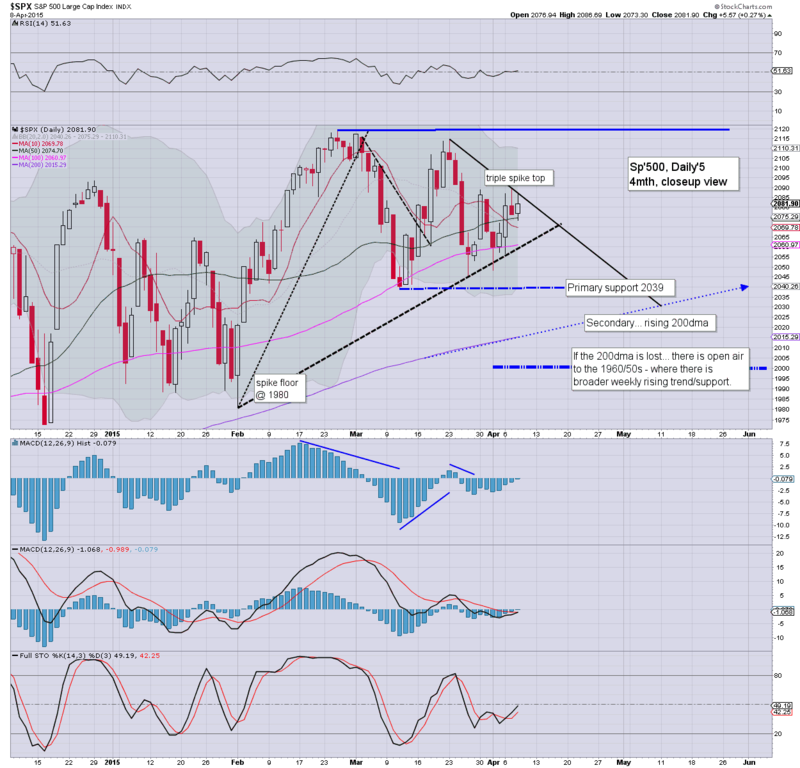 US equities are yet again battling to break and hold above resistance of sp'2088/89. VIX remains subdued, reflective of a market with near zero concern about anything. Metals are on the slide, Gold -$8. Oil is moderately higher, +0.7%.... but looking vulnerable. *Gold bugs will no doubt be in denial.... but price structure IS a classic H/S formation... Gold is headed for the giant $1000 threshold... probably by June. So... another open... much like yeseterday... which was much like Tuesday. AA, -4.3%... headed for $10/9 by late summer. I like the company.. but certainly not at $13... and not at this time. *I'm keeping an eye on Oil... but will give it another day to stabilise. 10.06am... once again.... no one wants to buy >2088... and the sellers (at least some).. are appearing. Broadly though... price action remains choppy... there doesn't seem to be an catalyst to kick things one way or the other. 10.45am.. and down we go.... as no one wants to buy >2088. Good morning. Futures are fractionally higher, sp +1pt, we're set to open at 2082. The market remains firmly stuck under resistance of 2088/89. Metals are a little weak, Gold -$2. Oil is higher by 0.8%. So... a broadly flat open is due... certainly nothing for the bears to get excited about. Price action remains a choppy mess. Even if we do slip lower from here, we surely won't break <2039 by the Friday close.... in which case... no real clarity across the weekend. 8.31am. Jobs data 281k.... 'reasonable' I guess you could say. Next up... Wholesale trade at 10am. Whilst the US market continues to see moderate day to day swings, there remains a powerful upward trend in the far east. China and Japan are already net higher this month by 6.6% and 3.0% respectively. 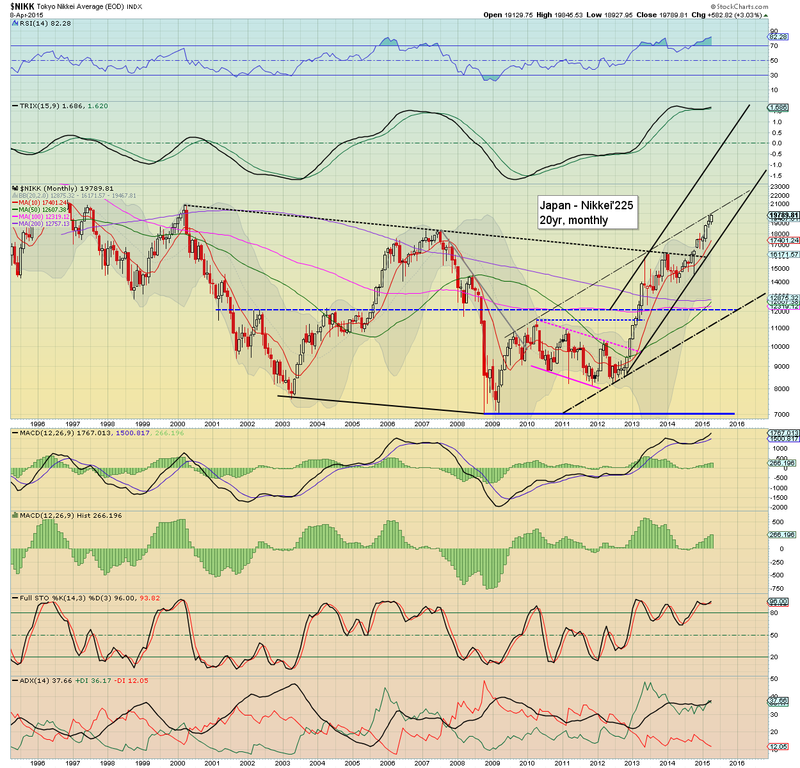 The broader outlook remains hyper-bullish for another two years. It is VERY notable to see the SSEC hit 4K today... with the Nikkei very close to the giant 20K threshold. On any basis... Asian markets are really strong.. and show absolutely no sign of cooling. Thursday will see the usual weekly jobs, along with Wholesale trade. US equities closed a little higher, sp +5pts @ 2081 (intra high 2086). The two leaders - Trans/R2K, both settled higher by 0.7%. Near term outlook remains very mixed, whilst the market remains stuck between resistance of 2088/89 and the recent low of 2039. Just another choppy day in market land.. with the sp'500 stuck within the 2089/39 zone.